Moretz Mill was founded in 1946 by C. Hugh Moretz as a hosiery broker agency, buying hosiery and underwear from local mills and sold to the wholesale and retail trade. In 1954 the company bought a Newton, NC manufacturing facility and started finishing hosiery products. In 1956 a knitting operation was added and Moretz became a fully integrated hosiery mill. Moretz continued its growth and in 1958 purchased Bothwell Mills, another hosiery operation in Newton and operated this plant as a subsidiary. In 1971 operations were combined into a new, 42,000 square foot facility, which was later expanded to 176,023 square feet. Moretz Sports was created in 1978 as John Moretz brought his passion for sports to the sock world. In 1996, Sports Scan P.O.S. rated Moretz Sports – PowerSox® as the #1 Performance Brand in America. By 2004, Moretz Inc. had become a Global Leader in sourcing, manufacturing, and marketing with a brand portfolio that included: PowerSox, Under Armour, New Balance and Kathy Ireland. The genesis of the kathy ireland Brand was created from the ground up with a collection of socks and today is listed as the 28th most powerful brand globally, by License Global Magazine, with annual merchandise sales of $2 billion, according to Forbes Magazine. By 2004, Moretz had grown to over 950,000 square feet of manufacturing, distribution and corporate space with sales of $120 million. On October 30, 2006 Moretz in association with the Blackstone Group acquired GoldToe Corp., the leading men’s designer brand and retailer of the iconic Gold Toe® sock. The newly merged entity became GoldToeMoretz with over 1,700 associates and sales exceeding $340 million. On April 15, 2011 GoldToeMoretz was acquired by Gildan, a multi-billion dollar company headquartered in Montreal, Canada and listed on the Toronto Stock Exchange under the symbol GIL. Currently, John Moretz and family along with his business associates operate Moretz Marketing. Moretz Marketing was founding in 1987 to manage lifestyle brands and create licensing opportunities. Past and current clients include: Kareem Abdul Jabbar, Ronnie Lott, Reggie Bush, Dianne Carroll, John Elway and Kathy Ireland. Long time residents of Catawba County and graduates of Lenoir Rhyne University, John and Marilyn Moretz were pleased to partner with the City of Hickory and the state and federal agencies to restore Moretz Mills. This collaboration spanned over two years and brings the greater Hickory community a historical landmark providing economic opportunities and aesthetically re-vitalizing the area. 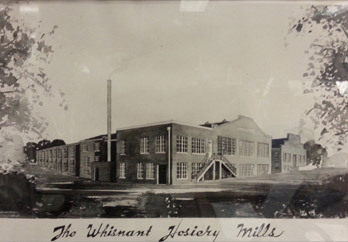 Original artistic rendering of Whisnant Hosiery Mills. The history of Whisnant Hosiery Mills reflects the development and expansion of the hosiery industry in Hickory, North Carolina, during the second and third quarters of the twentieth century. The hosiery industry played an integral role in the economy of the Southeastern United States and especially in Hickory, NC. The hosiery industry in this piedmont city began in 1906 and grew slowly at first, but by the third quarter of the twentieth century, it had become the largest industry and the primary economic force in Hickory. 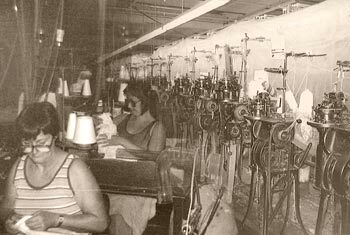 Only four mills were in operation by 1925, but by 1953, the number had increased to fifty-five, with 4,000 workers, and by the 1960’s and 1970’s, at the peak of hosiery manufacturing in Hickory, there were several hundred hosiery facilities. Like the hosiery industry in Hickory as a whole, the Whisnant Hosiery Mills started out modestly, with a small mill erected in 1929. From then on, however, the company enlarged its plant and workforce and updated its machinery almost continuously, with major additions built in 1937, the 1940s, and 1966. The physical appearance of the mill today tells the story of each period of its growth. By 1938, Whisnant Hosiery Mills, which manufactured, dyed, and finished men’s half hose, employed 525 workers and had the capacity to produce 3,500 dozen pair of men’s hose per day, far out-pacing the employment and production figures for all but one of the other mills at that time. [That mill, the Elliot Hosiery Mills, does not survive.] The Whisnant Hosiery Mills’ important status within the local hosiery industry continued throughout its history. In 1966, the company constructed its last addition, doubling the size of the mill. Replacing the warehouses that had stood on part of the site, the addition substantially expanded the mill’s manufacturing space for dyeing and finishing processes and provided a new and larger office suite for the management. Designed by Hickory architect D. Carroll Abee, the modernist brick, concrete, and glass exterior served to update the company’s image. The 1966 addition not only signified the high level of success the company still enjoyed, but coincided with the hosiery industry’s peak, as a whole, in Hickory. Whisnant Hosiery employees circa 1938.